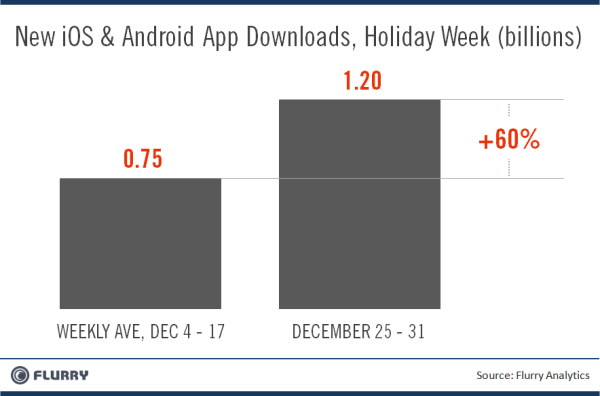 Google Android and Apple iOS mobile devices not only had a great holiday buying season on the hardware front with device activations spiking by 353% to 6.8 million units on Christmas day alone (along with 242 million application downloads – a new record), consumers also took to both platforms with great fervor, snapping up 1.2 billion new apps from December 25 – December 31 according to a report by Flurry. According to the report downloads grew by 60 percent over the early-December baseline with the United States contributing 509 billino downloads (42.3%). Flurry also reveals in their report that 2012 will likely be met with a very common 1 billion downloads per week. For this report, Flurry leverages its data-set from over 140,000 apps running on the significant majority of iOS and Android devices. With its application penetration, Flurry can detect over 90% of all new devices activated each day. Additionally, with its analytics service in more than 20% of all applications downloaded on a given day from the App Store and Android Market, Flurry can reliably estimate total iOS and Android downloads. To benchmark against the market, Flurry regularly triangulates its device and download figures with data released publicly by Google and Apple. Are you surprised by the massive number of new device activation rate and the number of applications downloaded for those devices?